As you stand atop elephant terrace and gaze east across the Royal Square of Angkor Thom  the last capital of the Khmer empire that dominated Southeast Asia for some 600 years until the Siamese sacked the city for good in 1431  you feel a bit like Shelley's traveler, standing before Ozymandias' half-sunk, shattered visage. All around are lifeless things  retaining walls of blotchy laterite, and sandstone temples that speak little of Angkor's former grandeur and its golden spires. There's no hint of the regal festivals that once took place right here, viewed from this same vantage by mighty kings beneath parasols of red silk. But there is an eyewitness report of life at the gilded Angkor court. 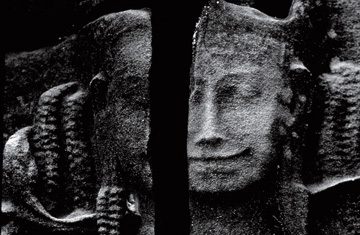 In fact, it is the only one: Zhou Daguan's A Record of Cambodia: The Land and Its People. Little is known about the elusive Zhou, a Chinese contemporary of Dante, who spent nearly a year in Ganpuzhi (or Cambodia, a land of "southern barbarians," frighteningly "coarse, ugly and very black," according to Zhou) before sailing back to China in July 1297. He was born in the 1270s in the bustling, cosmopolitan port of Wenzhou and was recruited, possibly as an interpreter, for an official mission to deliver an imperial edict to Khmer King Indravarman III on behalf of the Mongol Yuan Emperor Chengzong in 1295. That was the same year that a ragged, unrecognizable Marco Polo arrived back in Venice, jewels sewn into his grimy pants, from the court of Kublai Khan  Chengzong's grandfather and predecessor, who had died the year before. Sometime in or before 1312, Zhou published A Record before fading into obscurity. As the chronicle of a diplomatic sojourn, Zhou's patchy account reads at times like an official dossier instead of an exotic travelogue about a perfumed and misty land. He lists Cambodia's trade goods (kingfisher feathers, rosewood and beeswax in return for Chinese pewter, celadon and combs), stripping its flora and fauna of the romance of place in a manner more reminiscent of a CIA Factbook entry than Polo's Il Milione. "For vegetables," he writes, "they have onions, mustard, chives, eggplants, watermelons, winter gourds, snake gourds, and amaranth. They do not have radishes, lettuce, chicory, or spinach." Still, there's no better guide to Angkor Thom than Zhou's text, which breathes life into the mute, inanimate temples  unlike most of the Angkor-related books hawked in the tatty gateway tourist town of Siem Reap. Those are mostly bogged down with encyclopedic elucidations of Hindu and Buddhist iconography, with which Zhou hardly bothers. The Bayon, with its weird smiling heads, widely considered to be hybrids of the bodhisattva Avalokitesvara's face and that of the Bayon's famous Buddhist builder, Jayavarman VII, is for Zhou simply a "gold tower." The few times he does play the amateur art historian or archaeologist, he gets it wrong, as when he mistakes a massive recumbent bronze Vishnu (now at Phnom Penh's National Museum) for a Buddha sculpture. The prurient Zhou far more relishes (to our unending entertainment) relaying strange customs and fantastical tales he's encountered, like the Khmer women who urinate standing up ("and that is really funny"); the ceremonial, contracted deflowering of young girls by priests, which Zhou details in one of his longest passages; the stealing of human gall bladders; and the nine-headed serpent spirit that turns into a woman and with which the King must couple each night in a chamber at the top of the Phimeanakas (which is still standing). "If for a single night he stays away," Zhou tells us, "he is bound to suffer disaster." True or not, with Zhou's deliciously bizarre anecdotes as your guide (as well as his descriptions of daily life, from midwifery to mosquito nets to the wraparound sampot many Cambodians still wear today), the ruined capital suddenly becomes a Cecil B. DeMille production, overrun with slaves and lepers, loud with fireworks and boar fights. Imagine, there's Indravarman III standing next to you on the Elephant Terrace, bedecked in golden bangles, a four-pound pearl strung around his neck, both of you sweating buckets in the midday sun. He invites you for a dip in the royal pool nearby, as he should. Cambodia is "unbearably hot," as Zhou complains, "and no one can go on without bathing several times a day." That much hasn't changed.